This is about storytelling: how journalists tell stories to citizens; how nonprofits tell stories to journalists to convey to citizens; how we tell stories to each other to try to make sense of what is happening to our families, neighbors, and people we don’t know. And this is a plea for better storytelling from the people in clinics and classrooms, programs and public agencies, who have their hands on America’s future. This lesson acquires new urgency in light of recent events. Americans are trying to assign meaning to the catastrophic news of the past few weeks, and to fit them into their understanding of where our country is headed. Who will help them understand how to fit the pieces together into a coherent and practical plan for moving forward? Was Hurricane Katrina a “natural disaster” or a failure of foresight and federal planning? Is the gasoline shortage a cyclical event that we just have to ride out, or is it the inevitable outcome of irresponsible management of our energy policies? Is the suffering of so many African Americans in the Gulf a consequence of bad personal choices, or of structural impediments to opportunity which our society has overlooked? Are the consequences of inaction on these fronts confined to a small group of people in Louisiana, or will the entire society suffer, pulling in farmers from Iowa whose livelihood depends on the transport of grain along interconnected waterways which now prove sadly unprotected from risk? For these, as for many other events in our common life, the answer rests on the ability of storytellers to connect the dots between past actions and present conditions in ways that make clear to the public what’s at stake—and what can be done in the future—even as they clean up the debris. In the opening pages of Tropic of Capricorn, Henry Miller famously intones, “I will give you Horatio Alger as he looks the day after the Apocalypse.” Miller was castigating the inability of the myth of the Rugged Individual or the Self-Making Person to capture the reality of life for many Americans in the 1930s. A contemporary update might read, “I will give you the Ownership Society as it looks the day after the levees broke.” That story, still in the making, would focus our attention on the things we must do together, because they cannot be done individually: from building roads and a reliable healthcare infrastructure to improving schools and repairing the ladder of opportunity in our society. It is tempting in the aftermath of Hurricane Katrina to tell a Crisis Story and to conjure Sympathy by parading the Victims. It’s an old story, and one familiar to advocates, in which it is assumed that the cumulative weight of all the individual stories will at last convince the reader of the need for effective government, opportunities for all, and a wide array of social services. The other story, the story of the importance of safeguarding the public structures that protect us all, is a story only dimly captured in the brochures and annual reports of the nonprofit field. Yet it is this latter story that, our research argues, is best suited to opening American hearts and minds to the kind of long-term change we need in this country, if we are to achieve a true opportunity society. Clues about how to tell this new story come from a number of places. First, this article is informed by the FrameWorks Institute’s own multi-disciplinary, multi-method research on how the public thinks about social problems. From issues of race and work to the role of government and families, we have tested and retested what works to get Americans to engage in addressing problems—appealing to them as citizens, not consumers. This decade-long pursuit has yielded a number of recurring themes, many of which are infused into these storytelling recommendations. Second, public journalism offers nonprofit communicators a powerful vision that we can use to inform, model, and support our work. But public journalism is not a passive tool. It requires smart advocates who raise the expectations for journalists. We can learn from them—both good and bad habits—but we must test their storytelling devices against a goal of making people smarter about how we can make America a better, fairer, more prosperous place for all. Finally, this article uses a series of Ernie Pyle’s columns from the 1930s to demonstrate a different kind of storytelling. We maintain that the way he argued—interpreting Americans to themselves and helping them see their country and its values up close and personal—is an art we must recapture if we are to rediscover our collective public voice. In the end, journalism is far too important to be left to the journalists. It’s time to take back the territory of public storytelling. One prominent journalist, Phillip Ault, described Pyle’s ability to get away from the censors in World War II by remembering how he would go out and talk to people wherever he was. In this way, he broke several important stories about the political climate and public opinion as it affected various countries’ support for the Allies. “The story,” his competitor remembers, “was right under our noses.” But Ernie got the scoop, while the others waited for the official communiqué. For nonprofits today—engaged in communities, and aware of the interaction between people and place, intervention and outcome—the story of what is happening in America is indeed right under our noses. Ernie Pyle was a journalist, but this article is written for nonprofit advocates and service providers. What can advocates learn from a columnist long lost to history? We are increasingly dependent upon news for the way our issues are understood by the public. The press sets the public agenda, which sets the policy agenda. And the news is increasingly dependent on us as the sources for stories about what’s happening in communities, the impact of policies on people, and the opinions of community leaders. We are often inventing, writing, and pitching the rough drafts of the evening news. Learning new ways to frame our issues requires that we borrow from the best of journalism, understanding how to make the news that really does advance public understanding. Enterprise, Alabama—This is a New Deal story, so if you don’t like the New Deal you won’t see any sense in it. When the government took a hand here in 1935, six out of ten school children in the county had hookworm. Every other baby died at birth. One mother in every ten died in childbirth. The average mentality was third-grade. One out of ten adults couldn’t read or write. Three-fourths of the farmers were tenant farmers. Most of them had never been out of debt in their lives. They averaged only one mule to three families. And this is in Coffee County, which stands third among all the counties of Alabama in the value of agricultural products. These figures are not the scandalous revelations of some smart Brain Truster from the North. They are from a survey made by Southerners. Sure, you’ll find wealth and grace and beautiful homes in the South, homes as pretty and people as fine as anywhere in the world. But you drive the back roads, and you won’t see one farm home in a hundred that would equal the ordinary Midwest farmhouse. Coffee County has become a sort of experimental station in Alabama. Not by design, especially, but because the government people and the local agencies got enthusiastic, and it just grew up under them. Federal, state, and county agencies all have a hand. To prevent overlapping, they are coordinated under a council, with the county school superintendent as chairman. They say it’s the only thing of its kind in America. These agencies cover most everything from typhoid shots to fruit-canning. They’re like agencies in your home territory, only the need is greater and I suspect they are a bit more enthusiastic. The work is climaxed in the Farm Security Administration, which actually owns thousands of acres of land and plants these down-and-out farmers on its acres. I wish there were something to call these things besides “projects.” The idea of a project makes the farmers contemptuous, makes Republicans snort with rage, brings sneers from the townspeople. A project is Brain Trust—experimenting, regimenting people. What they’re doing here isn’t a project, anyway. They aren’t setting up a “settlement.” Nobody is forced to do anything. The six hundred farmers on FSA are scattered over a county twenty-five miles square. What they’re doing is simply a general and wide-stretching process—starting almost from zero—of trying to get people to live better. Rosen’s challenge has been echoed by journalists around the country. “It is time for those of us in the world’s freest press to become activists, not on behalf of a particular party or politician, but on behalf of the process of self-government,” writes the Washington Post’s David Broder. What would it mean to write in a new way? How can we drive these stories, first as storytellers ourselves—as advocates of and partners in a new level of discussion about our country’s future and the options that face us for getting there? Rosen suggests that citizens examine closely the composition of news to see how we would restructure the way we tell ourselves what is going on in our country. He says that in addition to setting the public agenda and other well-documented aspects of their profession, journalists also participate in (1) the art of framing; (2) the capacity to publicly include; and (3) the shaping of a master narrative. We will investigate each of these goals in order to attempt to arrive at a new way of seeing our role as public storytellers. Framing asks of each news story, “What was left in the story and what was left out?” There are also what Rosen calls “rituals of framing,” such as the two-sides rule or the human interest story. These ways of organizing the material, however, are not without consequences for the way we look at ideas (e.g. polarization, personalization). Conservatives have long argued a view of public life that is nothing more than the aggregate of individual experience, need, and accomplishment. As Margaret Thatcher once famously pronounced, “There is no such thing as society… There are individual men and women, and there are families.” Following this way of thinking, the logical response to the plight of individuals is to hold them solely responsible for their situation. The problem of low immunization rates among preschoolers, for example, is due to bad parents, not to the inability of providers to eliminate missed opportunities. How, then, is Ernie Pyle’s framing style useful to us? It is useful because it reconnects us with the importance of translating from individuals to programs, and from programs back to individuals. Also, precisely because most Americans lack the ability to connect it up, to fill in the frame, to pull explanations from other walks of life into the news story, individuals are left alone in the frame with their “problems,” responsible both for their problems and for fixing them. They get little help from the news media, where episodic frames dominate news coverage (which intrinsically advantages the conservative view of public life, which is also episodic and personal). Society, and the host of environmental forces that shape individual outcomes, is left invisible to most Americans. Ernie Pyle’s approach to storytelling is also useful to us because progressives have ceded ground on the issue of values. Values belong in the frame—an explicit part of why we believe what we believe. Values such as interdependence, opportunity for all, responsible stewardship, community stability and prosperity, prevention, ingenuity, and the common good—these must be lodged in our narratives, underscoring the forces and situations that explain why people rise or fall in our society and how they can and should be helped, outside of charity. And, finally, Ernie Pyle’s approach is useful because the traditions of journalism continue to be built around the human interest story. But Pyle changed that story. He found ways to connect the dots, to reconnect people to a bigger reality, to imbue their stories with meaning beyond the traditional capacity of human interest journalism. AN AFFLICTION CALLED “SORRYNESS,” Elba, Alabama—They have a way of using the word “sorry” down here that I’ve not heard in other parts of the country. A listless, no-good, poor-paying fellow is known as sorry. You can be poor without being sorry. You’re sorry when you lack character. One out of seven farm families in this county is now on government land. I asked how many really were in need of this kind of help. The answer was at least half. Probably half of that half are too sorry to get any good out of such help. But what I mean is that only half the farmers are doing well enough to live at all decently. There is no real money now in Southern farming. If a fellow is straight, keeps his place clean, has a car and enough to eat, and sends his kids through grade school, that’s all any farm can produce here now…. And when you get down and mix in it, you can’t say it’s wholly caused by cruel landlords, by sharpster supply merchants, or by erosion. You can’t blame any individual, least of all the poor people themselves….No, it’s a combination of the landlord and the supply merchant and poor land and low prices and sickness and ignorance—in other words, it’s the whole system. I haven’t much gone into detail about what the government has done here, because it’s much the same as in other places where they’re trying to recreate human beings. But they’re trying, through a thousand little pinpoints of practical education, to change the system. It’s a thankless job, for the system down here is as much a part of a man as his arm. It will take generations to get the rural South raised above its system. Sorryness is a disease that America hasn’t paid much attention to before now. It will take a long time to purge it. Maybe I get too worked up about things like this. Sometimes I think maybe a fellow should just shut his eyes and drive fast. Last night, I went to see a movie called St. Louis Blues. Dorothy Lamour was in it, and it was set on the Mississippi and was very romantic and full of the lovely old things of the South. I came away thinking that maybe my recent pieces were all wrong, and that Hollywood is right. I should have made Coffee County romantic, and full of guitars, and happy, happy Negroes, and sweeping bows to the ladies. Maybe I should, I don’t know. But Hollywood has never seen all the pale dead people walking slowly around the red clay countryside. The Elba, Alabama, column puts people in the context of a system. It asks who is responsible for the problem, and who should fix it. It reads like a takeout or a backgrounder. It asks why, again and again. It resists the temptation to give us one non-sorry success story. And it ends by inferring that the story we are getting isn’t the real story. That’s a lot to accomplish in a short column. Notice that, while many of Pyle’s columns are profiles, others are inventories of what communities are doing to help people and why. Everyone—legislators, journalists—wants human interest stories. But human interest stories can backfire. The news is inherently reductionist. If the reader or viewer walks away without an understanding of the role of the community in addressing public problems, your hard work planting a story won’t lead anywhere. Nonprofit communicators need to carefully consider the composition of the frame before they tell the story. Ask yourself the critical elements of moving from the personal to the political. What is happening in the structure of our society that made this employer act in this way? How does the problem work—what forces drive it and how does it affect us all? What solutions are available? And what is our collective responsibility to fix it and to help out? What happens to “us” if we don’t fix it? When we tell the stories of the folks who “clean up, carry in and carry out,” as Robert Reich once put it, we must make sure we are telling tales of our broader responsibilities to each other. In this way, the “values” stories we are telling are about our unfinished business as a society, not merely the sad anecdotes of individuals who must be addressed through charitable responses. “By selecting whom you include in a discussion,” says Jay Rosen, “the press tells us whose world public life is, who knows about it, who acts within it, whose voices count, whose lives are relevant, whose concerns are central . . . Journalists make casting decisions. They decide whom to cast in what roles in the drama of public life. Bill Moyers stated it best when he said it all comes down to whether you look out and see a nation of consumers or of citizens. Appealing to people as passive consumers often precludes our ability to portray and engage them in the business of public life. “I’m pro-choice on everything” reads a whimsical bumper sticker. Sounds good. But what is lost? Public schools, public parks, public housing, public broadcasting, public safety? And even if we were to be confronted with other people, other views, what would we do with that information? When the narrative is all about problems, and no solutions, people have little recourse to ideas of prevention and intervention. If what is asked of us are tears and charity, it is unlikely we will find our way to pragmatic action. “News stories position us in a wide variety of ways—as spectators or as participants, as insiders or as outsiders, as voters, as consumers, as fans, as victims, as celebrants, as sentimentalists. Take the sort of story we commonly call a ‘tear jerker.’ It puts us in the position of jerkee, the one from whom tears are pulled,” says Rosen. Ernie Pyle often told the stories of people outside the realm of ordinary existence for many Americans. Not many of Ernie’s family members would ever meet a black sharecropper or a black scientist, an Okie or a Columbia professor. Ernie saw his job as explaining who these people were, as well as the forces that acted upon them. Ernie Pyle’s America was not without skeptics. Pyle dealt with them by telling their stories, too. He would present a citizen’s opinions about the government; but he would also present “his side.” He argued with people and with reality. He talked back. But that talk was not the vituperative, mud-slinging of today’s talk shows—formats that have been shown to diminish participation in public life, not encourage it. Even when Pyle covered people who believed in ideas he found shallow, he relayed them as part of the bigger story, and he felt obliged to cover them, and to critique them. But tone is everything, in news and public opinion. And Pyle’s tone is one that keeps the dialogue open. A JERSEYMAN’S VIEW OF THE NEW DEAL, Sparta, New Jersey—The man who fixes autos in a little town near here said if I could find five people in the town who would vote for President Roosevelt next year, he’d give me five dollars apiece for them. “Everything’s a big mess,” he said. “The Three-A* has ruined the farmers around here. We pay big processing taxes, and the money all goes to the Midwest. Practically none of it comes back to the farmers around here. I suggested that President Roosevelt personally didn’t even know that road existed, so how could you blame him for doing that kind of work? Wasn’t it the fault of the local dispensers of work projects? And wasn’t even such wasteful work better than just paying the money out in straight relief, which would have had to be done otherwise? The man didn’t know about that. It was just all a big mess. And anyhow, the guys doing that relief work were out-of-towners. His town didn’t have anybody at all on federal relief. Only four people there were unable to scrape along somehow, he said, and the townspeople—not federal or municipal relief money—were taking care of them. The town isn’t very big; it doesn’t even appear on some maps. My guess would give it a population of five or six hundred. “Who are you going to vote for?” I asked. *Agricultural Adjustment Act. Passed in 1933, it sought to restore farmers’ badly sagging purchasing power by paying farmers to restrict their crop production and by imposing a processing tax on food processors. An amendment provided for lower-interest farm mortgages. POSTSCRIPT: President Roosevelt won reelection overwhelmingly in 1936. What Pyle did was keep the public dialogue going, explaining America to itself. We have lost both the language and the urgency for doing this. Again and again, he interjected himself as trusted intermediary in the discussion between different factions of Americans. He translated one to the other, under the broad banner of “us.” Ernie’s America was the original big tent. When nonprofit communicators engage in public speaking, they need to conscientiously help people engage in the debate. Bring divergent opinions into the discussion. It’s healthy for everyone to break down the stereotype that there are two sides to every issue. But talk back. Engage the reader/viewer in his or her capacity as citizen. Choose examples that average people can relate to. Interview your grocer, your hardware-store owner, your barber. Throw these questions to the community: What happens when we ignore these problems? Will they go away? Will charity pick up the slack? What will this mean for our communities, our country? Refuse to let the problems be buried under bureaucracies. Remind the reader that we have ways to deal with big problems collectively. If a certain program isn’t working, let’s fix it, not destroy it altogether. American ingenuity can go a long way toward getting people engaged in constructive problem-solving. For too long in this country, the master narrative has been dominated by the individual on the frontier—free to protect, defend, and provide for himself and his family. Anyone not in the picture is an outsider. The bonds of community are entirely voluntary and can be relinquished at any time. The body politic is to be viewed as a constraint on individual freedoms and to be used only as a last resort. Nonprofit communicators must ask, again and again, whether the big story they are telling citizens helps them perform their duties better, helps them see important roles for both business and government in accomplishing our common purpose. The vision of the good society, of what kind of “community” we want to create, is a powerful image, if we use it wisely, probing our own values as citizens responsible for creating and maintaining the greater good. We can begin this task by taking our storytelling seriously. It may be one of our most powerful tools. If we can’t find the public journalists willing to join us in this enterprise, we’ll have to take on the job ourselves. We’ll have to learn to tell the story that is right under our noses, in a way that invites America into the discussion. We must tell the stories of the people who pass through our classrooms, our clinics, our programs—in real people language. And just as important, we must tell the story of the places and forces that shape them, the places where they are lifted up or stuck. We must not make the mistake we have made in the past, talking about people as if they were programs with clothes on. We must step in and reintroduce Americans to themselves, to the shared fate that is the reality of life in this country. We must begin to tell the stories in new ways, drawing from the material that presents itself to us and borrowing our soapboxes in the form of op-eds, guest editorials, letters to the editor, and talk shows. We don’t have to write quite like Ernie Pyle. In fact, we don’t have to write at all. Pyle is useful to us, as we struggle for models, because his style is approachable and democratic. It lends itself to the kind of narrative we need to tell. It offers us a way in to the discussion. But each of us will have to learn to tell our story in language that is clear and true and compelling. And we will have to learn to tell these same stories in situations where those who can solve the problem are present. Ernie is gone, but, as Charles Kuralt said, he’s up there looking “over the shoulder of everybody who writes about America.” Remember that the next time you sit down to write your annual report. Iyengar, Shanto. Is Anyone Responsible? How Television Frames Political Issues. Chicago: University of Chicago Press, 1991. Pertschuk, Michael, and Phillip Wilbur. Media Advocacy: Reframing the Debate. Strategic Communications for Nonprofits Series. Washington, D.C.: Benton Foundation, 1991. Pyle, Ernie. Ernie’s America: The Best of Ernie Pyle’s 1930s Travel Dispatches. Edited by David Nichols. New York: Random House, 1992. Rosen, Jay. “Public Journalism as a Democratic Art.” Unpublished manuscript, 1995. Available from the Project on Public Life and the Press, New York University, 10 Washington Place, New York, NY 10003; 212-998-7965, fax: 212-388-0359. Rosen, Jay. “Politics, Vision and the Press: Toward a Public Agenda for Journalism,” in The New News v. the Old News: The Press and Politics in the 1990s, A Twentieth Century Fund Paper, 1992. Available from The Twentieth Century Fund Press, 41 East 70th Street, NY, NY 10021. Wallack, Larry, et al. Media Advocacy and Public Health. Newbury Park, CA: Sage Publications, 1994. 1. We would like to thank the Scripps Howard Foundation www.scripps.com/foundation/ for permission to reprint this and the following excerpts of articles written by Ernie Pyle and reprinted in this artcle. One of the Foundation’s objectives is to keep alive the legacy of Ernie Pyle and his writings. 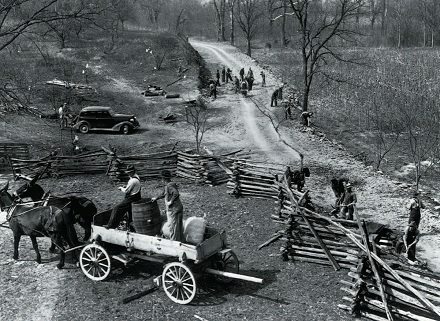 Learn more about the Ernie Pyle State Historic Site at: www.scripps.com/foundation/programs/pyle/pyle.html#top. Susan Nall Bales is founder and board chair of the FrameWorks Institute, an independent nonprofit research organization founded in 1999 to advance the nonprofit sector’s communications capacity by identifying, translating, and modeling relevant scholarly research for framing the public discourse about social problems. A veteran communications strategist and issues campaigner, she has more than thirty years of experience researching, designing, and implementing campaigns on social issues. She has worked to translate children’s issues for greater public understanding with the National Scientific Council on the Developing Child and dozens of other NGOs around the country.